Eloy Manzanares was born in Colorado in August, 1920 and raised in the little town of Garcia, just a few miles north of the New Mexico border. His parents, Eligio and Juanita, were longtime residents of rural Castilla County; Eligio worked as a shepherd in the rolling hills after his service in France and discharge from the Army. Eloy was an ambitious boy, and in 1932 enrolled at the Menaul School in Albuquerque, New Mexico. An athletic youth who idolized boxers like “the Alamosa Flash” and “the Alamosa Tornado,” Eloy was especially adept on the basketball court – “when not afflicted with old age and rheumatism,” quipped his yearbook. He kept his grades up, too (“a high scholastic record, even though he comes from Colorado”) which was a key part of his ambition to become a fighter pilot. Menaul School “Sandstorm” yearbook, 1939. Jobs in the Army Air Corps were hard to come by when Eloy graduated from high school, so when a vacancy appeared at the Albuquerque Army Air Base, he jumped at the chance – even though the role, as a typist in the base hospital, was as far from flying as one could get. Pilots were almost always commissioned officers; a college degree helped, and Eloy enrolled in a business course but only completed a year before the war began. Five months after registering for Selective Service, Eloy traveled to Santa Fe to enlist in the Navy. He may still have harbored dreams of becoming a pilot after following his basic training, but one look at his civilian job was enough to assign him to Hospital Corps School. Eloy completed the ten week course, plus an additional eight weeks of Field Medical School at the US Naval Hospital in Corpus Christi, Texas, before his assignment to First Battalion, 24th Marines on 4 November 1942. He was immediately promoted to Hospital Apprentice, First Class upon arrival at his new station. Doc Manzanares proved to be a capable corpsman; in May of 1943, he advanced in rank to the petty officer’s rate of Pharmacist’s Mate, Third Class. That November, he was selected for a somber responsibility. PhM3c Marion W. Justice had joined the battalion on the same day and from the same post as Manzanares; the two had been through a year of rugged training together. On 13 November, Justice suffered a fractured skull in a jeep accident, and died two days later. Eloy Manzanares escorted his buddy’s remains back to Sweetwater, Texas and attended the funeral. In January 1944, Manzanares (now a PhM2c) sailed for combat. He survived his first engagement at Roi-Namur (1-2 February 1944), but was grievously wounded just hours into his second, the invasion of Saipan on 15 June 1944. Evacuated to the transport USS Pierce for treatment and recuperation, Manzanares was deemed unfit to return to the battle, and on 24 June was boated over to the hospital ship USS Relief. The Relief brought him back to the Marshall Islands – now home of Provisional Station Hospital #2 – until 5 July, when the USS Bellatrix brought him back to Hawaii. Manzanares would spend more than ten months in the hospital. He was discharged from the US Naval Service at Long Beach, California, on 29 May 1945. 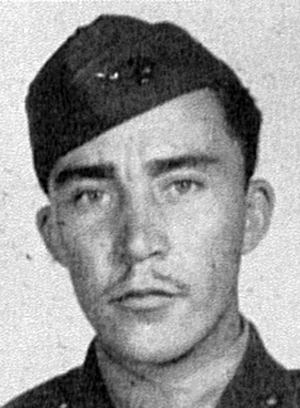 Eloy Manzanares in 1945, wearing the ribbons he earned in the service – the Purple Heart, Presidential Unit Citation, American Campaign Medal, and Asia-Pacific Campaign Medal with two stars. After his discharge, Eloy settled in Los Angeles, California. He met Elia Telez at a church function; the two were married in 1954 and had a son before separating. Eloy married again in 1966, this union with Helen Rhodes lasted until a divorce in 1973. Little else is known about Eloy Manzanares’ life after the war. He died in Los Angeles on 11 March 1982, and is buried in Forest Lawn Memorial Park.